Alongside 15 new independent bookshops that joined the Booksellers Association last year, A.N. Devers’ The Second Shelf might turn out to be the most attention grabbing. Launched in November, it deals in rare and rediscovered works by women, from all eras and divides. It’s a selling point, a mission statement, but not a "niche" as Devers is keen to point out. "I have been told I’ve found my niche," she says critically, "but women are not a niche." The response from the public and publishing industry has been overwhelmingly positive. The first time I visit, American feminist writer Roxane Gay is cherry-picking titles from the shelves, while the next time comes after CNN has wrapped up a profile on the bookshop for International Women’s Day - and a bookseller from Ghana tells me she’s jumped straight off a plane to visit the store (on a side note, Devers tells her she can’t keep hold of titles from women of colour long enough before they fly out). The Second Shelf’s home is not the neon-bathed side of Piccadilly but its more hushed, newer environs: Smiths Court to be exact. Even in today’s progressive climate, a feminist bookshop might still be termed radical, but at first sight The Second Shelf is anything but revolutionary. In fact, it is as comfy a vision of a bookshop imaginable: vintage style wallpaper, framed portraits, stacks of orange and blue spines on wooden bookshelves - and there’s even a pink kettle in the corner for a warming brew. At The Second Shelf, Devers has created a space that puts women writers at the forefront; a destination where you can find Hotel du Lac and Harry Potter in the same bookcase; where within the 3,000 titles it carries are first edition collectible Penguin paperbacks and Virago green spines and Jane Austen's best friend’s personal copy of Sense & Sensibility. Then there are names you may never have heard of - and this is where Devers really delivers. "Bette Howland, for instance, is a forgotten woman writer," Devers explains. "Well, she was until Brigid Hughes, founder of New York-based literary magazine Public Space, picked a book of hers off a dollar cart and ended up engrossed. She wondered who she was and found out she had published other books. After some sleuthing she discovered Howland was still alive and ended up dedicating issue 23 of Public Space to Lost Women writers with Howland a big part of it." For Devers, a writer, editor and dealer of rare books who has a close connection with Public Space, this story fuelled her desire to set up The Second Shelf. Most notably though, it was a visit to a book fair where she came across a rare edition of a Joan Didion novel priced $25, next to a Cormac McCarthy novel with a hefty price tag of $600. "These are two greats of American fiction, yet why have we failed to value the worth of women like Didion, and who else have we forgotten?" As a specialist in rare books, Devers left behind a "younger" and more disparate industry when she crossed the Atlantic from the US to the UK. Joining what she has found to be a more closely knit and active rare books market , she drummed up the idea to launch an online bookshop with a quarterly. A bricks and mortar store was never on the cards. But during a Kickstarter campaign set up in May 2018, which ended up raising more than £32,000, she received an offer too good to refuse. "An email came through from the shop’s landlords offering a space for a bookshop at a discounted rate. I thought it was a fake! A few months later I opened the store on my birthday." Timings couldn’t have been tighter, and while Devers is working furiously to clear a backlog of admin ("I’ve just paid a £4,000 legal bill"), she is glad to have opened when she did. "I’m really pleased we launched before December, as it gave us that key Christmas trading period, which has kept us afloat." Devers credits social media for building a community and buzz around the bookshop. She does, however, want to make clear that The Second Shelf does not piggyback movements like #MeToo. "Some people say it’s a good time to launch the bookshop, but we came before #MeToo. Reading women is not just a moment to be captured." Devers cites a few social media campaigns that provided momentum: "Writer Joanna Walsh started a hashtag #readwomen that added to the conversation about women’s writing." The Second Shelf is part of a growing network of bookshops focused on women writers. Last year Penguin organised a pop-up called Like a Woman, while this year sees the launch of The Feminist Bookshop in Brighton, and the Black Feminist pop up, which hits the road before its goal to open a physical shop in 2020. The community is growing, and is mutually supportive. For instance, The Second Shelf owes its name to the generosity of Meg Wolitzer. The American novelist gave her blessing to use the name, taken from one of her essays. "Meg speaks about women supporting other women, and I guess that’s what she did for me," Devers says. "She didn’t have to, especially since she didn’t really know me then." Devers, whose memoir Train is coming soon from Bloomsbury Literary, has much more planned, including throwing the doors of her shop open to a host of events, launches and social salons. 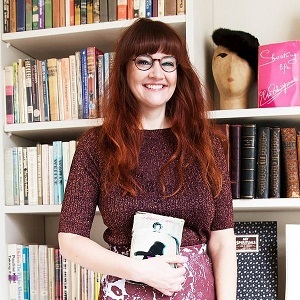 "We’re starting an author series with our managing editor and literary critic Lucy Scholes, who will be discussing favourite women writers," she reveals. "On 15 March we’ve teamed up with Ache, a small magazine publisher, for a series called 'Reading Women', featuring writers including Sharlene Teo and Olivia Sudjic. Then on 22 March our first book launch takes place with a small press called Handheld, which is reissuing women writers. They are republishing Rose Macaulay’s What Not, a speculative fiction novel which preceded Brave New World. Parts of it were suppressed, and it was never published in the form she envisaged. Sadly I can’t do too many lates as I’m a mum, so it’s impossible to be at the store every night, but I have a babysitter on Thursday, so I guess that’s my event night!"